About ten seconds after the initial excitement died down, questions regarding Zotero Everywhere‘s release date started rolling in. While we’re not quite ready to provide a firm timetable, we’re happy to report that within days of our announcement our skilled team already had alpha code for standalone Zotero in hand and accessible via our fully open code repository. This software currently requires users to jump through a few tricky hoops to build and install, but within the next few weeks we’ll package an alpha release that’s more easily accessible to bleeding edge testers and developers. In the meantime, I’d like to offer a peek at what we have so far. All core functionality, including server sync and integration with Microsoft Word, is already in place. And the most exciting part of standalone Zotero, integration with other browsers, is well underway. Here are a few screenshots of the code in action just a few moments ago. I’ve added a couple of red circles to draw attention to the new import icons in Chrome and Safari, but otherwise this is exactly what the software looks like now. Integration with Google Chrome. 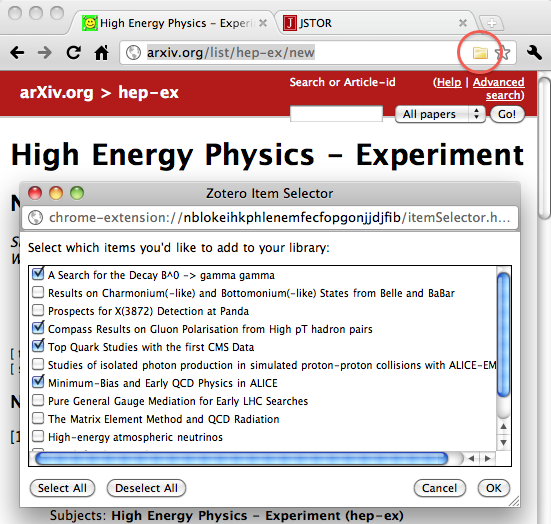 Note the Zotero folder icon, just like in Firefox! Search results work beautifully. 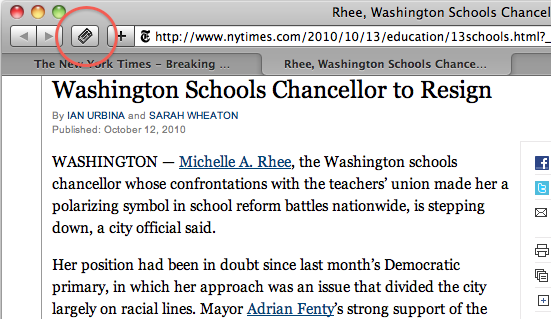 Integration with Apple Safari. We’ve customized Zotero to take advantage of Safari’s distinctive look and feel, and here we’re grabbing a newspaper article. Standalone Zotero showing the above items after one-click import. I actually had Chrome and Safari open and firing items at Zotero simultaneously. Along with standalone Zotero, work is progressing rapidly with Zotero Everywhere’s expanded API, as well. Stay tuned for more news on that front soon! Team Zotero is hiring a full-time Outreach Specialist! Do you love Zotero? Love libraries? Love stickers and t-shirts? If you answered yes to any of these questions, you should consider joining us! The Outreach Specialist will hold a wide range of exciting and critical responsibilities, including: leading project outreach; monitoring the support forums; building relationships with libraries and scholarly organizations; authoring software documentation; managing the project’s social media presence; representing the project at a range of conferences and events; and developing and leading workshops for higher education administrators, librarians, and scholars. We are looking for an energetic, well-organized individual with excellent written and oral communication skills. The ideal candidate will have: a B.A. or advanced degree in library science, the humanities, or social sciences; proven communication and promotional skills; and experience working on software projects. Experience with Zotero and its user community highly desirable. For more information, please visit https://jobs.gmu.edu and search for position number 10378z. You are currently browsing the Zotero weblog archives for October, 2010.